A few weeks back a commenter named Bill left me a note on my Muffler Man Photo Gallery asking where the big man from Chicopee, Massachusetts was. I snagged him a few weeks ago on what was probably the hottest day in the history of forever. I didn’t even get any ticks or spiders on me walking through the high grass trying to get a good look at him. 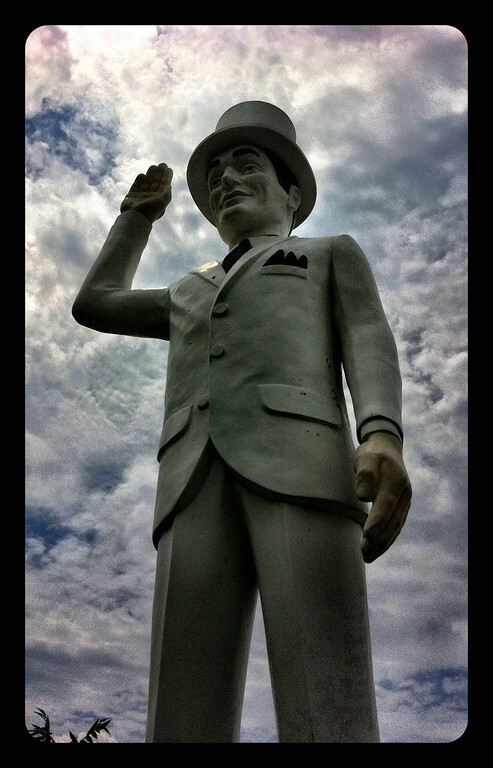 You can find out more about the Big White Guy on Roadside America. The only “muffler man” that I’ve encountered here in the Alaskan interior is in North Pole along the highway. Holy cow! We’re used to seeing giant lumberjacks, etc, but never a guy in a suit! How weird. And, even stranger, he’s waving like the Queen of England.